Spoiler alert, we didn’t foil the plot. The Kubota caught fire, and CA had the most mellow delivery ever. Below is a dramatized transcript of this phone call. I love that man’s delivery to bits. Only he could be calm in the face of a tractor fire. Unlike me. I am the woman who called my mother when the house caught fire when I was 14. What do you do when the house is aflame, you call your mommy. Not the fire department. That would make too much sense. She was thrilled by the way. I believe her response was something along the lines of “Why the hell did you call me and not 911?” What can I say, I don’t do so well with panic. It turned out to be a minor tractor fire, as far as tractor fires go. It was still drivable, but it was losing coolant like crazy through one of the charred hoses. Luckily the fire didn’t make it to a fuel line, and miraculously the tractor was in the field when this happened and not oh, say, in the hay barn surrounded by a ton of flammable material. See, only a little fire! AH! Life lesson/ Public Service announcement: When you inherit a tractor – please make sure to examine it carefully and see if there are any dust screens that need to be cleaned regularly. 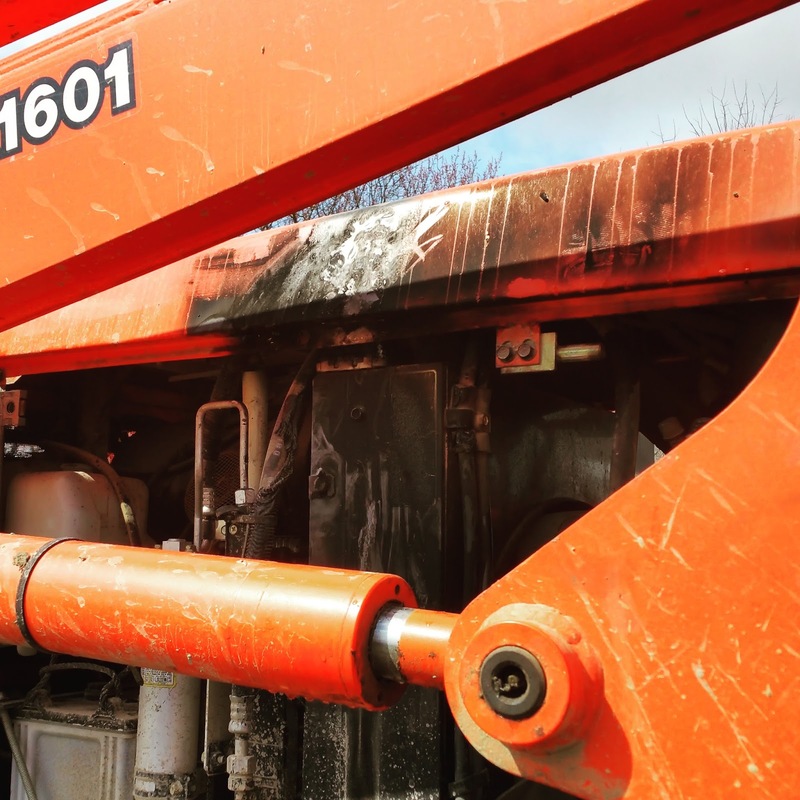 Dried grass can accumulate and spontaneously combust when you treat a Kubota like the good old Ford, that has no dust screens or actually, much protective shielding at all. You can lose a hand with ol’ Blue, but by golly, she isn’t a fire hazard. She has her own issues, beautiful old gal. Blue is such a good tractor. Like this past weekend when I was trying to finish planting with her (since you know, the Kubota is now in the shop…) and hydraulic fluid started shooting out of the back like I had driven over a green Old Faithful. Did I mention that I don’t do well with panic? I did manage to remember to turn the tractor off rather than just stare in abject horror. So, there is that. I then did the ever popular unplug the hydraulic hose and stare at it, plug it back in and look at the leak. Unplug the hose, re-plugin the hose, unplug the hose, re-plugin the hose, unplug the hose, re-plugin the hose, unplug the hose, re-plugin the hose, and repeat until I finally called CA. 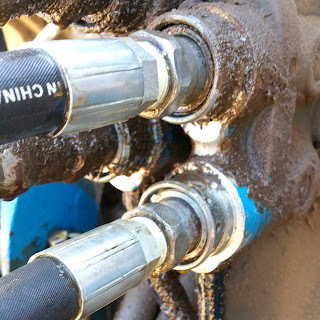 “Hey, so, if the tractor had started to geyser hydraulic fluid and I wanted to troubleshoot it without calling my dad, and unplugging it and plugging it back in again didn’t work, what could I do?” I am admittedly horrible at mechanical things. I take full responsibility for that. I’m trying to be better, but it is not my strong suit yet. CA, who was shopping for birthday gifts and home remodeling components at the time, was unable to diagnose the problem via the phone and my crappy pictures. I don't know why he couldn't diagnose it. I mean, there is even a drip forming and everything! 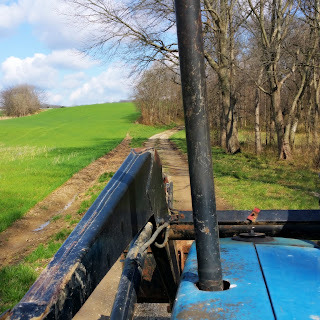 And yes, given my lack of mechanical aptitude it is weird that I was the one in the field with the tractor and he was out shopping; but we have a weird relationship. I grant you that. Maybe in retrospect it might have been better to conform to gender roles there. But then how would I learn? I can tell you that after having to call my dad to help me, I now know how to diagnose a blown O-ring (dang thing had dry rotted) and will never miss that one again. Especially not after having to buy all the replacement hydraulic fluid. That stuff ain’t cheap. But O-rings are! And we now have a stockpile of them. Take that Murphey and your stupid law, or Hilter and your evil plot, whatever it is that is making this planting thing WAY too difficult.